After years of legal squabbling between Microsoft and the European Commission, Redmond will soon make it easier for Internet Explorer users in Europe to switch Web browsers. Starting next week, Microsoft will offer a "Web browser choice screen" to Windows users in Europe who have IE as their default browser. 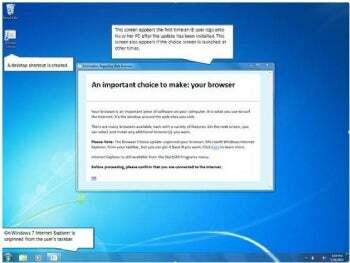 The browser choice screen will arrive via Windows Update. Initial testing is limited to Belgium, France, and the United Kingdom, with a phased rollout across Europe starting the week of March 1. Windows XP, Windows Vista, and Windows 7 users will either receive the browser ballot automatically, or they'll be prompted to install it, depending on their operating system and Windows Update settings. 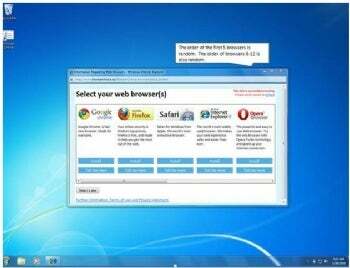 The browser choice screen will display a list of the leading five browsers presented in random order: Google Chrome, Mozilla Firefox, Apple Safari, Microsoft Internet Explorer, and Opera Software's Opera. Users will need to scroll to the right to see additional browsers. Microsoft agreed in December to allow IE users in Europe to choose their default browser, a settlement that ended the European Commission's lengthy antitrust investigation into Microsoft's business practices. Critics, including Opera Software, had accused Microsoft of hampering Web standards and abusing its power by tightly integrating Internet Explorer with Windows.